I tell everyone that I’ve homeschooled since 2006. In truth, I’ve only taught my child directly for about three of those 11 years. 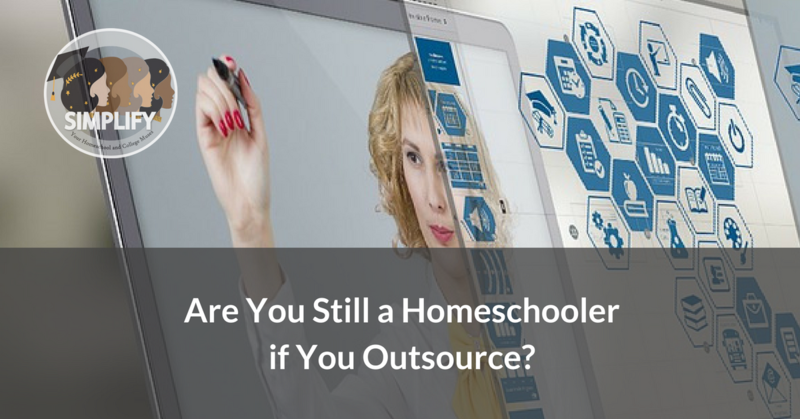 When we do the math (and math was the main reason we began outsourcing), I was “Kiddo’s Homeschool Teacher” for less than a third of the period that I claim to have homeschooled. The rest of the time, either my child taught himself or someone else did. I was ashamed to be outsourcing so prolifically (every subject save English and History). When homeschooling parents on support forums proudly claimed to be their children’s sole teachers, I often felt moved to scrap the outsourcing plan. I thought if I could just buy the “right” curriculum, it would gently hold my hand as I impart great wisdom to my willing, eager child. But that’s a homeschooling fantasy. More likely, their tweens are in a food fight while mom or dad tries valiantly to mentor a writing assignment to the teens and the cat chooses that specific moment to gift the family a dead mouse which sets one of the kidlets screaming in glee and the other yowling in fear. That the parents still persevere is probably the best testimony there is to the courage and commitment of homeschoolers. In my home, the scene would have been eerily peaceful (assuming the dogs were outside). My teen would be curled up in the armchair reading Borges. It would have been the perfect setting for a lesson. I could have grabbed an article about Latin America from The Economist for example but I often allow teachable moments to pass. Although we discuss loads of things in the car and while grocery shopping or listening to the news, I am not a born teacher who can spin an actual “lesson” out of thin air. Outsourcing helped me to be a “more switched-on” Mom. My teen and I enjoy a very close relationship. As both mother and teacher, I could often be testy and stressed by the end of the day. As simply mom, I am friend, enabler, cheerleader, consoler of perfectionist tendencies, chauffeur, and sometimes chef. An exhausted mom…but not an unhappy, irritated one. My teen is much more willing to work with me when I approach learning as mom vs. teacher. He is also much more willing to produce output for someone who is not mom. My child met fabulous mentors. By choosing to spend money carefully, we were able to secure fabulous teachers. These were all highly-qualified people who were subject-matter experts first and teachers second. They loved what they taught and it showed. Their lessons were engaging, challenging, and meaningful. I know that my child was inspired towards academia as a career choice thanks to many of these teachers. One of the disadvantages of homeschooling an only child is the lack of exposure to multiple opinions on a topic. By outsourcing, my child was able to obtain different viewpoints instead of only mine. Socratic-style discussion with his mentors helped him to become a more mature and critical thinker. Outsourcing freed me to be a fellow student, similarly curious and challenged. By watching me learn, my son discovered how to take notes (we both often doodle in our notepads). Although it took my teen longer to catch up with executive function skills, we outsourced long enough that he developed an ability to switch almost seamlessly to community college classes for high school. A source for letters of recommendation. Outsourcing helped my son find recommendation writers easily when it was time for college applications. Throughout the years, some of my teen’s teachers sent warm letters of recognition of my son’s great learning attitude and some of those lines became treasured quotes in my counselor letter to adcoms. Outsourcing helped me to share what I love. Outsourcing helped me to focus more energy on my own key interest: British literature. For example, I did not have to worry about assignments and output when I discussed literary analysis with my son because he was so obviously fired up by my own enthusiasm that I was confident he would do well later with formal lessons. By the time he was ready to take literature classes as a dual enrolled community college student, he had a very rich background from which to supplement class discussions. He excelled even when he wasn’t always eager to write essays. I am now convinced that outsourcing was a key contributor to my child’s love of learning. It’s not the only way to homeschool but it is a very valid method to introduce incredibly rich variety to your child’s education. Next StoryWhat’s Up With Simplify?